On BYJ - you are really tall ! 1. Boys, please wash your feet before getting in bed. 2. Wash your face, brush your teeth, and put on your p'jamas. 3. 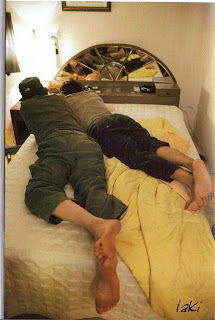 Yong Joon sweety, please go to your own bed, this is too small for you, you will fall off . 4. Stop reading and turn off the lights...no more talking ! 5. No, you may not have another glass of water. 6. Go to sleep right now, tomorrow you start shooting. 7. Goodnight, I love you too [he he he] OOhh I'm glad they don't need tucking in anymore....I'd be too s s s scared !!! Photo : lifted from Soompi Forum, credit as labeled. Myoce, This is a very sweet picture. Not seen them before. Nice one! Thanks,Hyds.... when I saw it..I couldn't resist..